Frances Ramos has endorsed your work as Photographer at Bill Barbosa Photography. 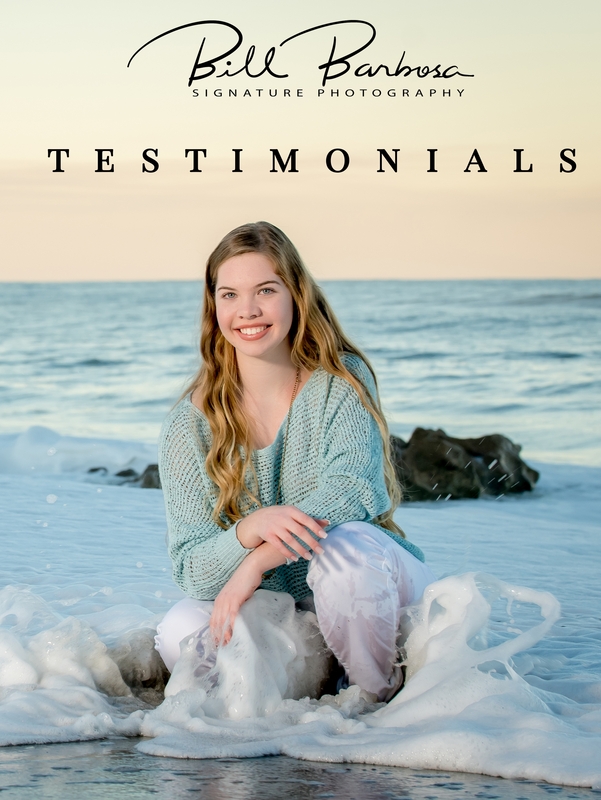 Details of the Recommendation: "Bill was first hired to be our photographer for our wedding in 2006 and from the first call that we made to his office I was completely blown away of how friendly his staff was answering the phone and answering all my questions. I hired them on the spot on the phone and we have hired Bill for all our important occasions including our son's first pictures and family pictures as well. I can't rave enough how amazing he is and even though he may be a little higher in price, at the end of it all it's worth to pay for his work. Will be calling on him for the years to come for sure." Bill Barbosa is a Maven in the Photography field. Getting portraits taken can be awkward and uncomfortable, but Bill had the mystifying ability to make me feel immediately comfortable though humor, honesty, and flattery. His expertise came through right away and the photo shoot ended up being the most fun I had all week. The consultation after the fact, which took place at his studio, made me feel like a valued customer. The photographs were so beautiful it was virtually impossible to narrow them down, but Bill gave me ample time to decide. Bill takes the process of photography up to a new level and I would undoubtedly recommend Bill for any/all types of event or situation that needs photos and cannot wait until I need photos again. Thanks, Bill!!!! “Bill is by far the best, most likable, creative photographer I have ever met. He doesn't just capture images, he captures the emotion! I've used Bill for business, family portraits, etc. I can't say enough good things about him and his work. “Bill made it very easy to create a great family moment. Bill paid attention to every detail. His creativity, promptness made it extremely pleasant to work with. Bill, I have to say you were the most patient, creative photographer I have had the pleasure to work with. First with Tracy and Jason's engagement pictures, then their beautiful wedding, and now precious pictures of our beautiful grandson Holden Storm. Frankly, we consider you more like a member of our family who is there to help celebrate precious memories with photos. Of course, we cannot forget your mother who has been there for most of the celebrations working along with you. Thank you so much and our best to you always. Bill is not only a professional but a great person. I am a director of 4 preschools and Bill does all the children's pictures. His quality of detail and relationship with the children make him fun to be around. The end result is high-quality pictures. I hired Bill for the most important day of my life, my wedding day. Bill was very professional and personal. My guests had a great time with him and every picture was wonderful. He was very creative in designing a beautiful wedding album of our most precious memories. He was also very reasonable and we got allot for our money. We were extremely impressed with him and recommended him to all our friends and family. My husband and I remain friends with Bill to this day. Bill has photographed my wedding and my baby. He is amazing, a very nice guy, professional and produces the highest quality of work. He's the best! “We have worked with Bill in several projects, His professionalism has no limit. He has the ability to create stunning imagery and results. We highly recommend him and his work for any situation or need. “Bill is a very personable man, with an eye to quality. He works closely with clients as a sound adviser and gives with grace. Lincoln Soule, Chairman, BETE Fog Nozzle, Inc.
“I have accompanied Bill Barbosa on several photo shoots. Bill is the consummate professional photographer, with strong ethical values. He creates outstanding images by leveraging his strong interpersonal skills, artistic gift, superb preparation, and technical know-how.